As global adoption of Microsoft PowerApps continues to grow, we want to highlight the work of some of the app creators in the community. 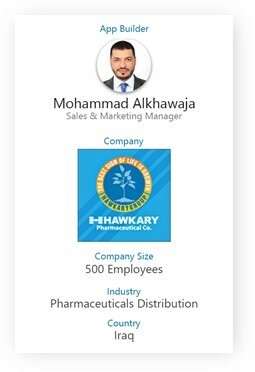 In this blog post we’ll look at how Mohammad Alkhawaja, a Pharmaceutical Sales Manager at Hawkary Pharmaceuticals in Iraq, digitized the reporting of daily sales visits using PowerApps, Microsoft Flow, Common Data Service and Power BI. Mohammad calls this a Doctor Relationship Management (DRM) solution. Mohammad is a pharmacist by training and considers himself a self-taught tech enthusiast. He ramped up on these technologies using online training content and the community forums, and was successful at replacing their old Excel-based process into a mobile solution with medical sales reps submitting data through a tablet app and managers viewing rich aggregated reports in Power BI. Hawkary distributes pharmaceutical products to doctors in Iraq. Several hundred field representatives call on doctors across the country to educate, place samples and take orders for pharma products. These medical sales representatives report back their activities to corporate where the data is used to track the engagements. Hawkary employed Excel and email to collect “daily reports” from their sales reps. The central sales and marketing organization would sort through the excel files to glean insights. 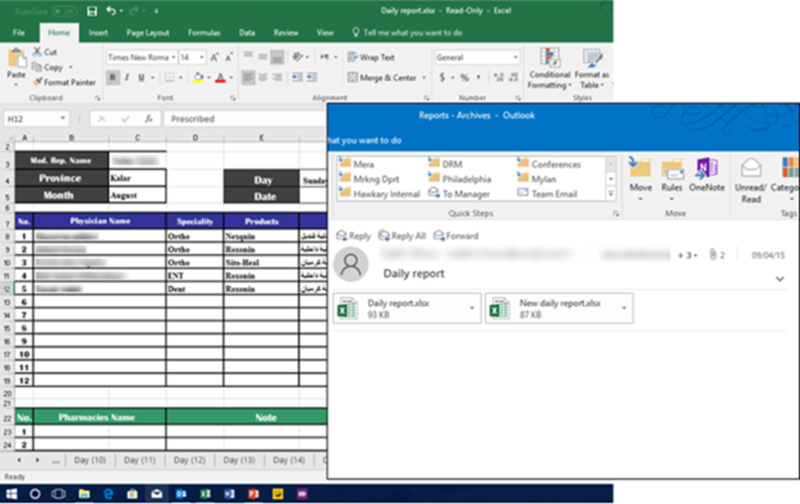 Sorting through emails to find attached Excel files, then opening hundreds of Excel files to glean insights from the reports was time-consuming; and it missed many opportunities to learn from the underlying data. It was nearly impossible to do meaningful analysis across all these sheets – how many times was a product promoted, how many daily visits were sales reps doing in a certain region, trends over time on a particular product sample uptake. PowerApps – Two PowerApps apps were developed. One used by field sellers to plan their visits and report on the same. Another used by supervisors to view visit reports and provide coaching for individual sellers. 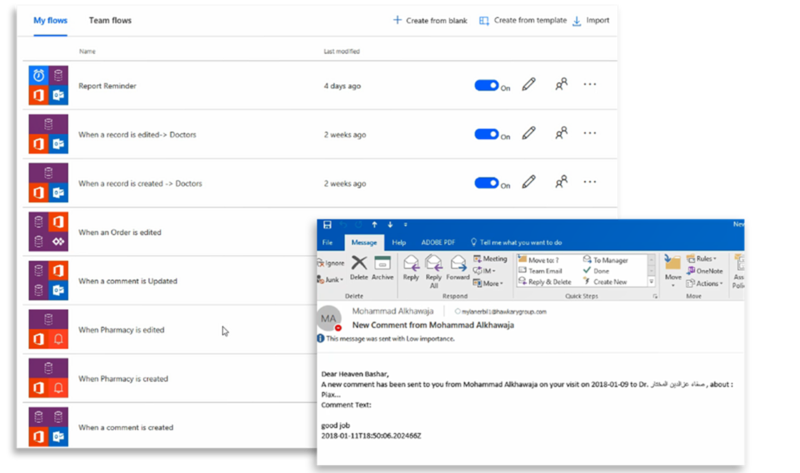 Microsoft Flow – Many flows were built to send notifications and reminders for sales reps to take actions when certain events occur (e.g. 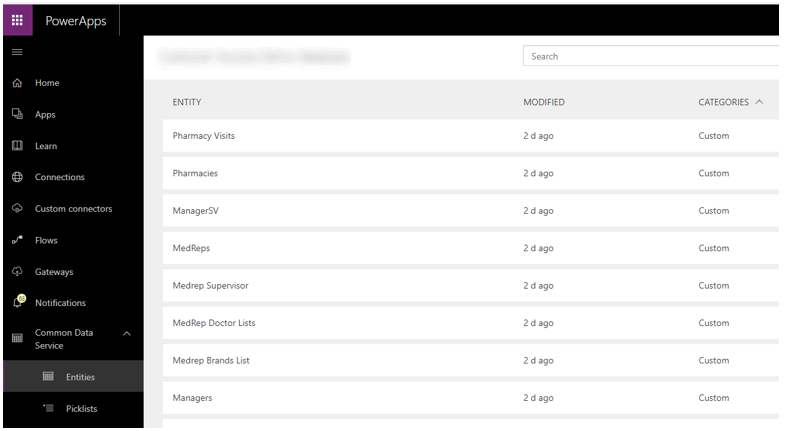 when a new pharmacy is created, when a report is due, when an Order is created in PowerApps). Some of these are triggered from the apps, others execute automatically based on external events. Common Data Service – All data for the application is stored in the Common Data Service, making it easy to trigger Flows, build new PowerApps apps and build Power BI dashboards and reports. 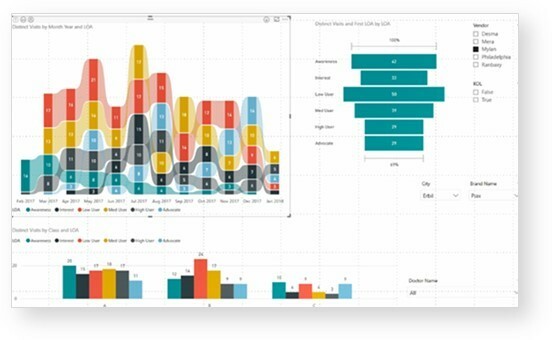 Power BI – Power BI reports exist to understand sales rep productivity, product performance, customer prioritization, and related analysis. 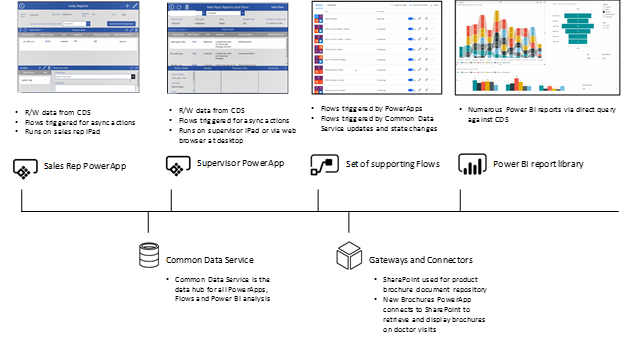 Full-spectrum use of the Business Application Platform – with CDS serving as the core data repository, surrounded by PowerApps, Flows and Power BI reports and dashboards. 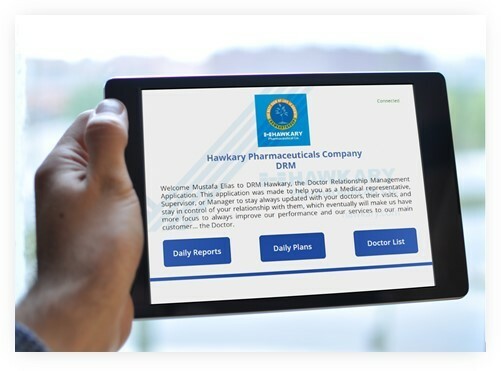 For their latest PowerApps app – a mobile brochure viewer – they used a SharePoint library that was leveraged via the PowerApps SharePoint connector. Sales reps use the app on an iPad to send daily reports, manage plans and view comments from supervisors. Supervisors use the app on an iPad or desktop to view daily reports and plans, provide coaching comments and manage doctor and product list. Several flows are used to send notification emails when different actions occur, such as when a medical rep submits a daily report or receives a comment from a supervisor. Flow is also used to send reminders, e.g. when a report has not been submitted. 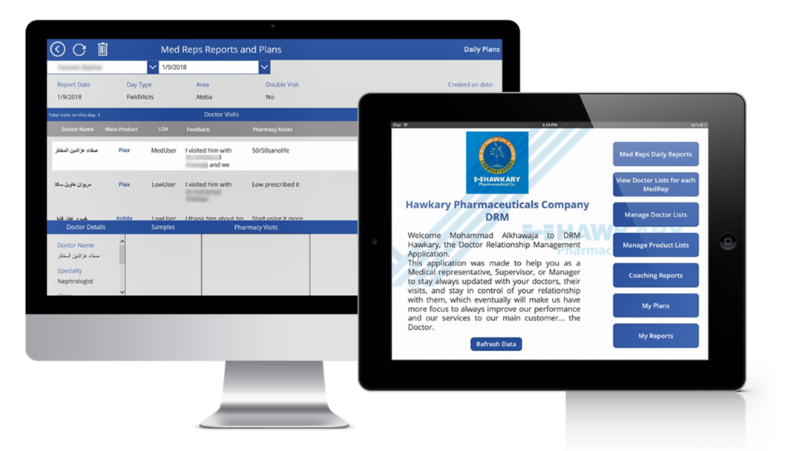 Managers use aggregate reports to gain insights into areas such as performance of sales reps, which doctors to focus on, and which products to promote. All the data is stored in a set of related entities in the Common Data Service.